As a barrier island off Georgia’s coastline, Tybee Island has served many purposes throughout the centuries. Native Americans used its bountiful wildlife as hunting grounds while 16th Century pirates used its dense foliage and freshwater inlets as a haven from their rather hectic lives. Although Tybee doesn’t see very many pirates nowadays, it’s still regarded as a hunting ground, albeit with a slightly different goal. Each year, over one million vacation hunters descend upon its expansive sandy beaches in search of the ultimate game: relaxation. With such an elusive target, how can you ensure success? As previous vacation hunters already know, accommodation quality determines whether you go home with replenished relaxation stockpile or empty-handed. Located along the southernmost residential district, Reese Residence positions guests within minutes of culinary adventures and unparalleled beaches. However, its coveted location isn’t the only amenity offered by this sprawling vacation home. Designed to reflect the vibrant colors of our beaches, Reese Residence isn’t what you’d expect from Tybee vacation rentals. Other vacations homes Tybee Island typically follow the hotel rulebook when it comes to interior design. From bland walls to lifeless decor, standard Tybee vacation rentals aren’t usually regarded as a visual adventure. But then there’s Reese Residence. From the moment you park in the reserved parking space, it’s clear this isn’t your standard vacation home. Others may design for sterility, Reese Residence is designed to fully immerse you into a sea of pure comfort. The pastel color pallet adorning walls creates an inviting space reminiscent of traditional beachfront cottages. Tired of vacations homes Tybee Island designed like a box? If so, you’ll fall in love with the varied room sizes and shapes found throughout the home. Much like the waterways surrounding the island, hallways meander throughout its 2,200 square-foot floor plan. Tybee Island vacations should help you unwind and enjoy time with your loved ones. The open living room and kitchen floor plan keeps everyone together without feeling overcrowded. Within the living room, there’s ample seating for your entire family to unwind after a long day. The tan sofa invites guests to kickback and relax on its plush cushions. 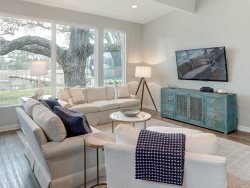 With an adjoining loveseat and arm chair, everyone can be cozy while playing a game on the oversized coffee table or watching a movie on the flatscreen TV. Off to the side of the space is the retro-inspired dining table. With a glossy surface and seating for six, it’s perfect place for a homemade breakfast or playing a round of cards. If there’s one thing the living room and kitchen area is missing, it’s not seating. The kitchen island features elevated barstool seating for three. Just because you have to be in the kitchen doesn’t mean missing out on stories and laughter from the living room. More importantly, it means snacks are only a few steps away from the comfort of plush seating and conversational hilarity. As you move into the kitchen, the stainless steel refrigerator offers convenient access to perishables while kitchen island sink makes washing hands before dinner a breeze. The full-sized glass cooktop range oven can support even the most complex of meals. Cleanup is effortless thanks to the smartly placed dishwasher. Like our other Tybee vacation rentals, Reese Residence comes fully stocked with everything from dishes and utensils to cookware and dish soap. Reese Residence is designed to bring groups of loved ones together. With a total of four bedrooms and three bathrooms, you’ll never feel cramped while preparing for another day of adventure. Each of the four bedrooms features a unique style and sleeping arrangement. Regardless of interior design elements, bedrooms come with comfortable linens and plush pillows to help restore your mind and body. Sleeping arrangements vary from a sprawling loft-inspired bedroom with two king beds and a flatscreen TV to a cozy retreat outfitted with bunk beds and two armchairs. Other bedrooms include two twin beds while the last bedroom offers more privacy with its queen bed and private bathroom. When you think about vacations homes Tybee Island, delightful bathrooms probably isn’t the first thought. But that’s exactly what you get at Reese Residence. Each of the three bathrooms delivers a hefty dose of personality. From its bright color choice to its perfectly designed fixtures, morning routines have never been so fun. With so many options, the only problem with Tybee Island vacations is deciding what to do. Situated along the southeastern shore, Reese Residence solves this problem by putting you within minutes to almost everything Tybee offers. This is perhaps the greatest amenity out of any vacations homes Tybee Island. Located just off U.S. Highway 80, getting in and around Tybee is as easy as pulling out of your private parking space and turning north. In only a few minutes, find yourself basking in the culinary delights and entertainment attractions along the Tybee Beach Pier and Pavilion. Continue to drive north, and step back in time at the various historic attractions, such as the famed Tybee Island Light Station. While Tybee and Savannah offer a variety of sites and attractions, the real star of Tybee Island vacations is the beach. Reese Residence delivers the rare beauty of Georgia’s coastline in only a few minutes walk. In less time than it takes to grab your Monday morning coffee, you’ll be soaking up the warm southern sun along one of the most celebrated beaches in the country. Experience Our Comfortable Paradise - Book Reese Residence Today! Whether you’re hosting a friends getaway, or an overdue family retreat, Reese Residence offers the rarest amenity out of all Tybee vacation rentals, relaxed luxury. From its fun and welcoming decor to its unprecedented beach access, isn’t it time to experience the best in Tybee Island vacations? Take charge of your vacation and book your stay at Reese Residence without delay!